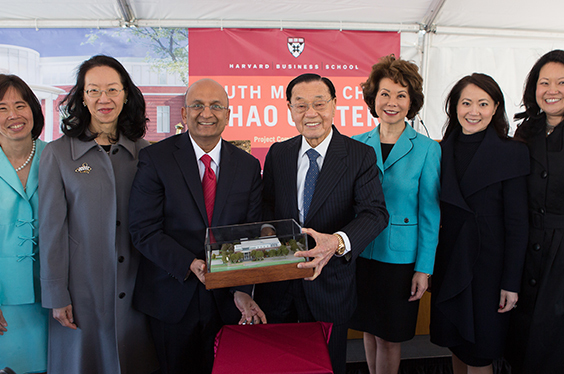 In April, 2012, Dr. James S.C. Chao and Chao Family Foundations made a philanthropic gift that would become the genesis of a new first at Harvard University and Harvard Business School (HBS). The gift coincided with HBS’s celebration of 50 years since the first woman was admitted to its MBA program. A generous donation would fund the construction of an elite educational center to accommodate the HBS Executive Education Program, as well as endowing a fellowship for scholarships. The facility, to be named the Ruth Mulan Chu Chao Center, would honor and commemorate the outstanding contributions of Dr. Chao’s late wife, Ruth Mulan Chu Chao. The building would also be the first on the HBS campus to be named for someone of Asian-American heritage and the first to be named for a woman. ​The dream of a building that would serve as an everlasting tribute to the legacy of the Chao family matriarch came alive on June 6, 2016. The HBS campus filled with government, academic and corporate luminaries, who came to cut the ribbon and open the doors of the Ruth Mulan Chu Chao Center for the very first time. The 90,000 square feet facility will serve as a nexus for the stimulation of thought, sharing of ideas and the coalescing of emerging leaders from across the world, as they come to the HBS campus to take part in the Executive Education Program. Many dignitaries addressed the audience at the dedication ceremony, including Dr. Drew Faust, President of Harvard University, Dr. Nitin Nohria, Dean of Harvard Business School, both US Senators of Massachusetts Senator Elizabeth Warren and Senator Ed Markey, Governor Charlie Baker, The Honorable Elaine L. Chao, and Angela Chao, Deputy Chairman of the Foremost Group. The Honorable Elaine L. Chao and Angela Chao spoke about the impact their mother had on their lives, as well as on educational excellence and cross-cultural communications. Secretary Chao said that her mother, who was a very modest person, would have been humbled to have a building named in her honor. Angela Chao expressed her hope that the building will serve as a source of inspiration for the tens of thousands of students and empower them to collaboratively develop solutions to the world’s complex challenges.